Jesper Jensen has created a memorial baton honoring the fallen soldiers of the Princess Patricia’s Canadian Light Infantry. Fashioned from sterling silver, 18-karat yellow gold, and maple wood, the baton is hand-made and hollowed out to make room for an honor roll of 1866 names of PPCLI members who lost their lives in battle since the infantry’s formation in 1914. 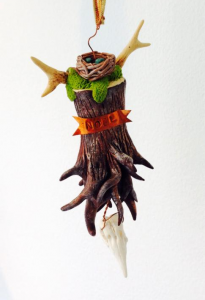 Wendy Wallin Malinow received an AdORNAMENTS Excellence Award from the Racine Art Museum for her ornament design. emiko oye has been commissioned to create the next limited-edition pin for Art Jewelry Forum. The pins will be distributed exclusively to all new and renewing AJF supporters in 2015. 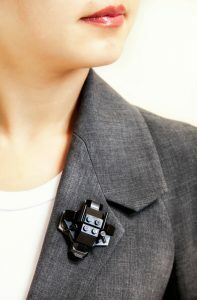 Each brooch consists of a base of seven LEGO® affixed together, and eight to 10 additional toy bricks in a single color, which recipients can use any way they like to build their own configurations atop the base. Mary Lynn Podiluk has been named a 2015 NICHE Awards Finalist for her handcrafted engagement ring “Infinite.” Inspired by language, the body and nature, Podiluk creates conceptually based jewelry and hollowware pieces. Other SNAG members have also been named as finalists. See more about the 2015 NICHE Awards. 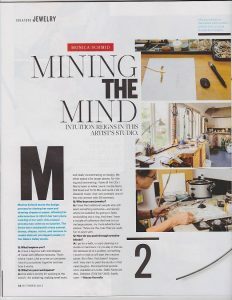 Monica Schmid has been featured in Diablo magazine, a monthly publication written for the San Francisco East Bay. Schmid uses color, stylized forms, textures and stones to create wearable paintings. Geralyn Sheridan was one of nine designers invited to participate in the 2014 MJSA Design Challenge: A Mother’s Love. Her design was a sculptural ring representing a painting, framed in diamonds and tourmaline. Elizabeth Shypertt is curating jewelry for San Francisco Bay Area clothing designer, Babette. A virtual exhibition celebrating the breadth of our field and membership. SNAG is excited to present WE ARE SNAG: Identity, an online exhibition. This is the first a series of juried exhibitions featuring SNAG members and celebrating the breadth and diversity of their field. The exhibition was carefully juried by Tim McCreight, C. James Meyer, and Stacey Lee Webber. “Sydney Lynch Jewelry: Interpreting Her World” is at Aaron Faber through December 31. 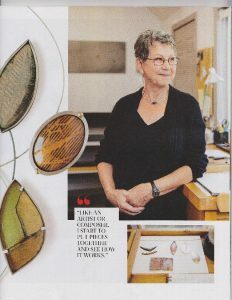 Lynch is inspired by the world around her, transforming the colors, textures and spirit of her visual experiences into one-of-a-kind and production jewels. See more exhibitions in this week’s news post.